Middle Garden's main path was one of the very first garden paths I created. But how quickly things have changed! The shrubs I planted doubled in size in no time, and the trees grew quickly above. Rhododendrons took over the under-story, particularly one beautiful pink rhododendron whose flowers seem to last for months. Most of the original shrubs planted by Middle Bridge are still going strong - or should that be 'growing' strong? 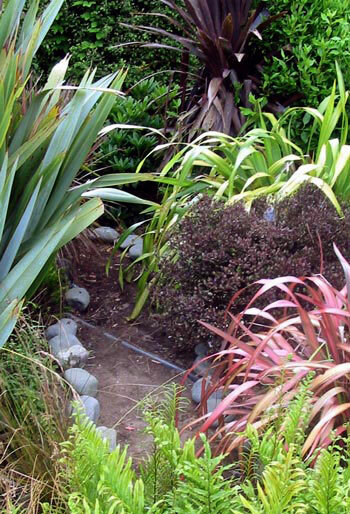 A red leafed native Myrtle and a trio of red Cordylines provide beautiful colour. Two Viburnum tinus shrubs either side of the path have turned into trees, and I've trimmed them deliberately to form an archway. Unfortunately a couple of Phormiums growing path-side have had the chop, as has an original Hebe. But that's garden life! Further along this shortish path is a silver Astelia. It grows underneath the big rhododendron, and I love it, though its leaves are a real nuisance, and can easily trip up the unwary wanderer. Opposite it are some clumps of edging Hostas. I've also planted dwarf Agapanthus, whose foliage I love, and some cream flowering Bergenias. The path is wheelbarrow wide, and covered in soft bark mulch to suppress the weeds. Well, that's the theory! In the archive photograph below the trees and shrubs were only knee-high, so there was scope for flowery things, and I boldly planted bright red zonal geraniums and red flowering canna lilies. It was my first country garden colour lesson - bright red, which could frighten town gardeners, looked fabulous out in the bigger spaces of a country garden. 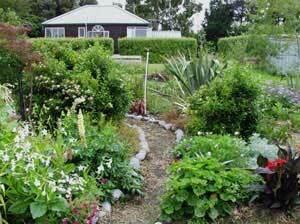 The other side of the path was edged with tussock grasses, lemon Lupins, and some deep crimson Peonies. And, because Middle Path was much sunnier back then, it even accommodated two standard roses and some clumps of dwarf daylilies. I used rows of chunky river stones to define its edges. The path used to get blocked by self-seeding Nicotianas (of the large 'sylvestris' variety), and Cerinthes and bright blue Forget-Me-Nots would congrgrate near the bridge. All these flowers were so appealing that it was hard to pull them out and clear the path. The tussocks had to have haircuts every month to stop people slipping on their trailing foliage. Low growing Euphorbias would flop over the path every summer - they still do. I get the feeling that Middle Path has always been trying to tell me something. Middle Path's destiny has always been somewhat functional, as a short, direct woodland thoroughfare. But there are two other paths in Middle Garden, much more whimsical and ephemeral in nature. One loops through the rhododendrons, around a huge tree stump where my Golden Hop runs riot in summer, and emerges by the huge Cordyline onto Duck Lawn. 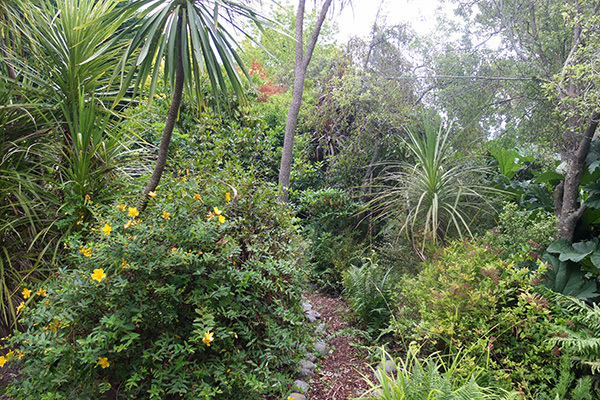 I've recently cleared overgrown Pittosporums from this route, widened it, and edged it with river stones. 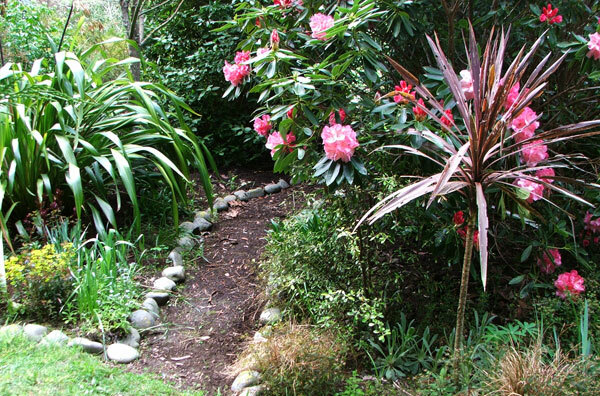 In winter it's possible to push through from the rhododendrons to a small path by the water's edge. But at other times waterside growth from giant Gunnera and species Phormiums take up all the available space. No problem - I just block off the watery path with river stones, rather than trying to keep it trimmed.